Biggz, if you are not familiar with our family, is the affectionate nickname for Andy’s mother, Linda. Please don’t make me explain how it came to be…just know that it is now so set in stone that her “grandmother” name is Grandma Biggz. This is her recipe. It is a staple in every Shaffer household that I am aware of. We can go through two batches a month in our house! 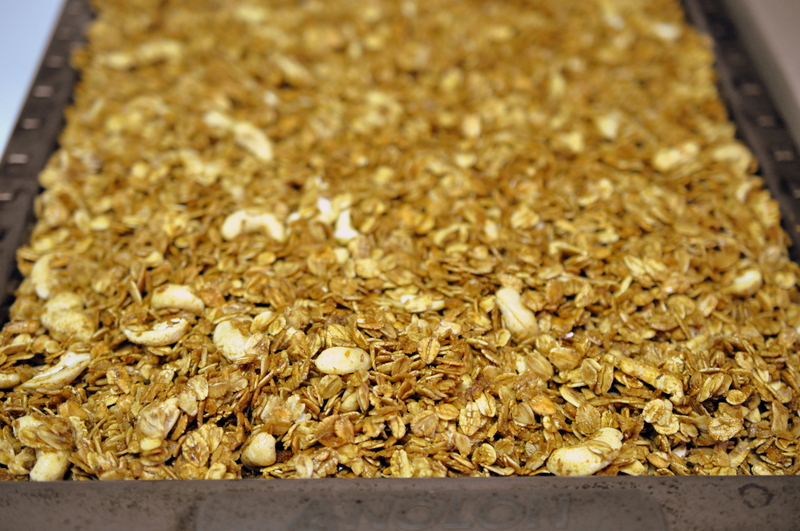 What I REALLY wanted to title this post was our real name for this granola. If you didn’t pick it up from the first paragraph, Andy’s family is prone to giving people and things nicknames. Early in our dating life Andy and I went to Boston to visit his brother Matt. His parents were coming up for a visit as well. Matt asked Andy “Are they bringing the puppies?” I assumed this meant that they had A). baby dogs and B). there were more than one of them. But no. It turns out that was just one of their many nicknames for their dog. Mr. Puppies. Along with: Shenanigans, Bear, Big Mon, and Mr. Furz. The dog’s real name was Baron but I wouldn’t learn that until much later in our dating life. He answered to all of the above so you can understand my confusion. 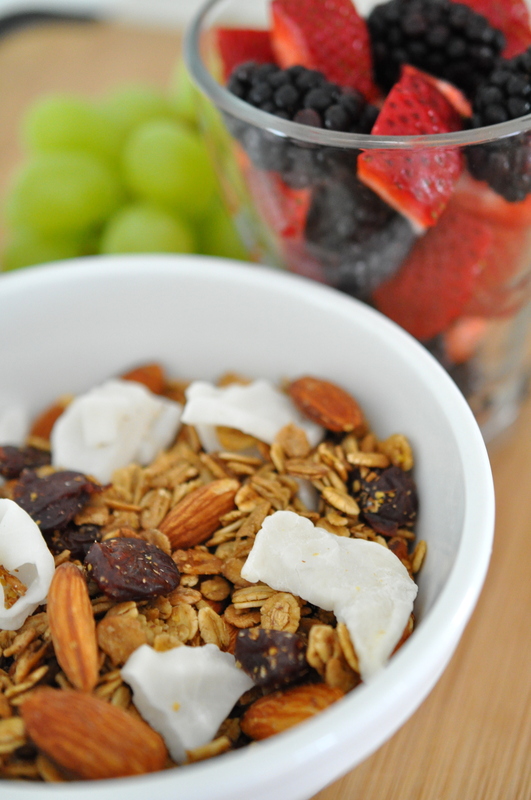 Nicknames aside, this is extremely delicious granola! (I’ve been meaning to blog about it for a long time but we end up eating it all before I get around to taking photos, so the photos are not all of the same batch.) The best part is that the recipe lends itself to endless variations. Change it up however your family would like it. Change it according to your mood, or the time of year, OR find your favorite variation and stick with it – Whatever makes you happy. I’ll write out the original recipe and then tell you our favorite way to make it. I do modify it a little from Linda’s original (more fruit and nuts, slightly less salt, and an extra tablespoon of extract) but it’s really the same. “Same same but different!” as they would say in Vietnam! 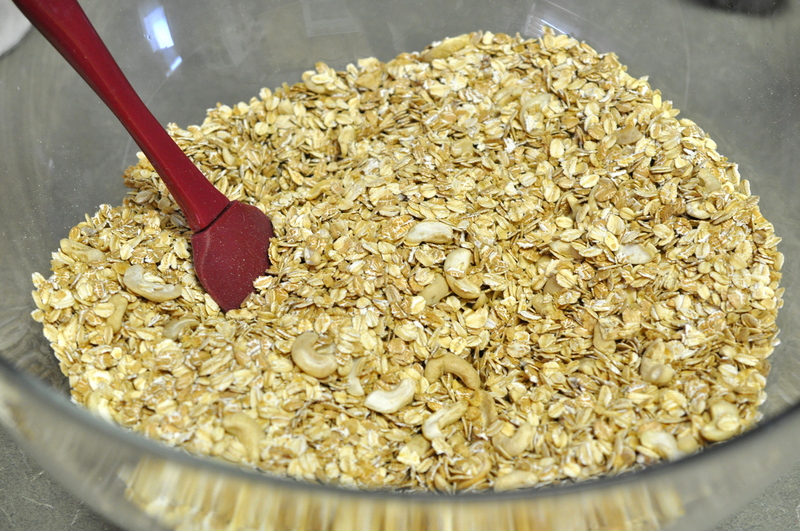 8 cups rolled oats or combination of rolled grains – I use one bag of Bob’s Red Mill 5 grain rolled hot cereal, which is 4 cups, and 4 cups of regular rolled oats. 1 cup TVP (Textured Vegetable Protein) – Oddly enough my grocery store doesn’t carry this but Walmart, of all places, does! So if you can’t find it, try Wally World. 1/2 cup oil – safflower, sunflower, canola, I use extra virgin coconut oil, melted. 1 Tbsp salt – I typically use 2 tsp. 1 – 2 Tblsp extract of choice. Vanilla, coconut, almond…I use 1 Tbsp vanilla and 1 Tbsp almond. 1 cup nuts, your choice. I use 1 1/2 cups. 1 cup dried fruit, your choice. I use 1 1/2 cups. You name it, you can put it in! These days I’ve been using cherries. Andy also loves dehydrated Strawberries but those can be hard for me to get sometimes. 1 cup large flaked, unsweetened coconut. When I can get it, we prefer dried young coconut. Love the texture and the flavor! Preheat the oven to 325 degrees F. In a large mixing bowl, combine grains, nuts, and salt. Do not add dried fruits. In a smaller bowl combine oil, liquid sweeteners, and extract. Pour over the grains and stir until combined. Pour mixture onto a jelly roll pan. It will be a lot and you will be tempted to put it in two pans but don’t. It’ll get overcooked…I know from experience! Bake for 12 minutes. Stir, return to oven, and bake for 12 more minutes. Remove from oven and let cool, stirring now and then. I usually wash the bowl I mixed it in and pour it into the bowl to avoid spillage when stirring and cooling. It will get crunchy as it cools. When cool add dried fruit. In the summer my favorite way to eat this is over yogurt with fresh berries. In the winter I like to put berries over it, pour milk (or vanilla soy milk! ), and microwave for 40 seconds. Mmmmm. She likes you more I have been asking for the recipe forever! haha Now I have it! You didn’t have this recipe yet?!? But you’re a Shaffer!! 😉 Glad to be of assistance! KS..my sincere apologies.. have given this recipe out so many times I didn’t realize you had fallen through the cracks. For GF I have used GF oats, rolled Quinoa, rolled buckwheat, rolled barley, and rolled rice. Some of these can be hard to find but our local Natural Grocers carries most and I can hook you up with some if you want. 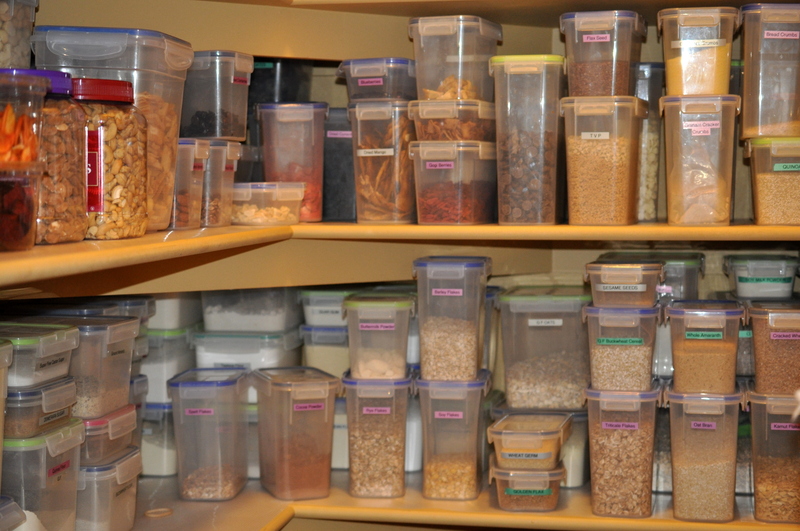 As to the OCD pantry, guilty as charged! The endless whole grains began to take over and I had to teach them who’s boss.That’s just my little power trip. Very fun to read this recipe! I’m forwarding it to George. 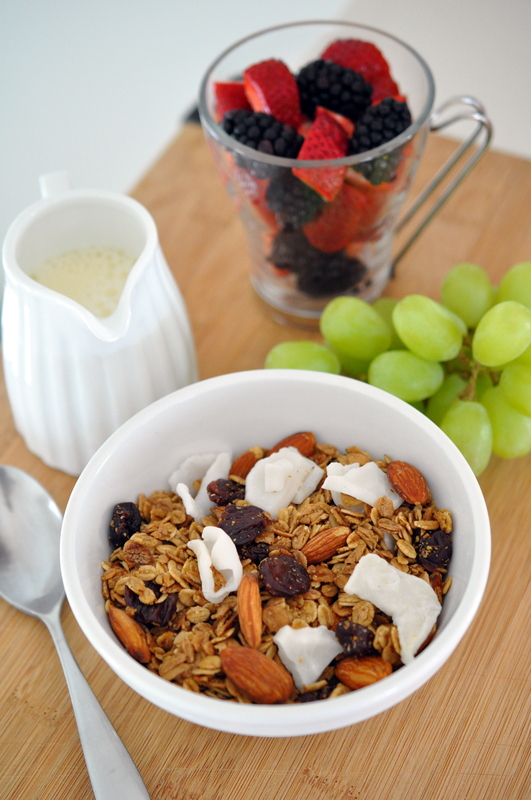 He’s been making wonderful granola for the past year or so, restarting a tradition from his bachelor days. We love it, but our kids won’t eat it. But that’s another story. Anyway, this recipe is quite similar in many ways. Thanks so much for sharing! And I loved the running blog post too! Congrats on your success becoming a runner!